Yet Another Theory of the Fed? Uggh! The world hardly needs another theory of the Fed, especially so soon after its Jackson Hole symposium. But we have a theory, too, and who knows, ours could be as close to the bulls-eye as any of the others. Plus, our theory is easy to explain—it rests on the simple premise that decision makers worry mostly about their reputations. We’ll propose that reputational risks are the primary drivers of central bank policies, and then we’ll use that belief to predict a major policy shift. Why are reputations so important? Cynics might say they determine how much central bankers get paid once they leave the FOMC. Ben Bernanke, for example, wouldn’t collect $250,000 speaking fees and plush consulting contracts if he hadn’t bolstered his reputation during the Global Financial Crisis. And that’s not all—the crisis also lifted Bernanke’s power and importance beyond what it would have otherwise been. By landing in the Fed chair at an opportune time, he profited immensely. But our theory doesn’t depend on that particular type of cynicism. We doubt that personal greed drives the Fed’s policy decisions. Whether they intend to cash their golden tickets or not (we’ll take the over on “intend to”), we view FOMC members as highly regarded folks who’d like to remain that way. They’ve reached a foothold at their profession’s highest mountain’s uppermost peak, from where the only direction is down. And remember—they didn’t arrive safely at their foothold by accident. If the president taps you for FOMC duty and sends you before Congress for approval, you’re already adept at protecting your reputation. You’ll probably do “whatever it takes” to steer clear of any reputational damage that could arise in the future. When we talk about reputations, though, we’re not saying that a central banker’s legacy depends on whether her policies succeed or fail. Reputations are far more nuanced than that. Policies that fail can still preserve or even enhance the policymaker’s reputation, and vice-versa. What matters most is how the policymaker succeeds or fails. So Bernanke was a central figure in the lead-up to the crisis, but you already knew that. Our point is that it had little effect on his reputation. Among mainstream economists and in the mainstream media, he’s currently basking in the admiration of his “courage to act.” By comparison, his critics, mostly in the financial sector and outside the mainstream, point to his shortsightedness. Which perspective wins? As of today, the “hero tale” dominates. Just as presidents need only act presidential to gain plaudits during wartime, central bankers need only act aggressively to gain plaudits during financial crises. In either case, it doesn’t matter what came before. With those ideas in mind (that we’re dealing with perceptions more than realities), let’s look at the reputational risks faced by today’s FOMC. We’ll argue that the current decade’s primary risk—the risk of a 1937-style relapse into recession—is fading in importance. Until recently, an echo recession similar to the one that snuffed out the mid-1930s recovery would have been a reputation killer. It would have led people to question whether the 2008–9 recession would morph into another Great Depression, after all. Even worse for the professional economists at the Fed, it would have lowered their status among the people who matter most to them—their peers. Consider that many economists (including Bernanke) blame the Great Depression on the Fed. Those economists would have surely piled on their policymaking contemporaries if the recent growth pattern had looked anything like the 1930s double dip. In any year from 2010 to 2016, a recession would have triggered a rethink of whether today’s monetary pooh-bahs are truly superior to those of the past. As Dylan said, though, the times they are a changin’. 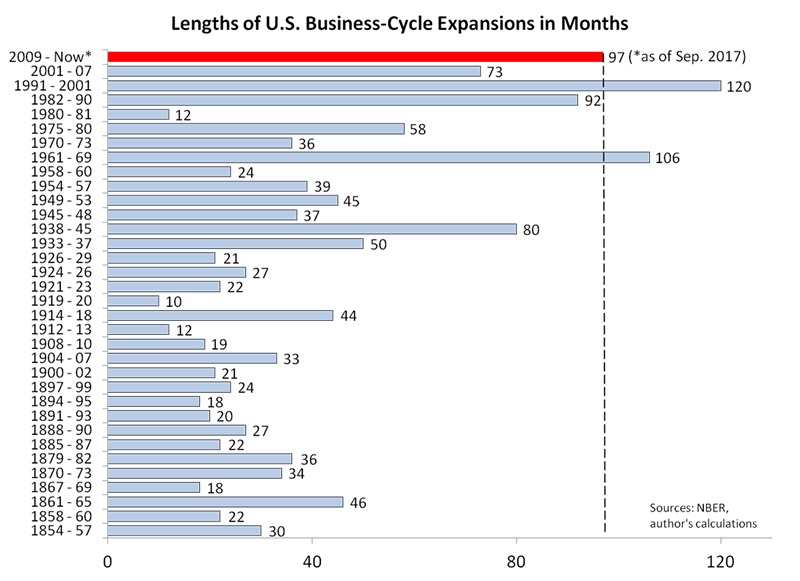 The current expansion is now the third longest on record, as shown in the chart below. And if it continues through July 2019, it would become the longest on record. By that time, the Fed’s reputational armor would be as thick as ever. It would be thick enough to deflect any attempts at equating current policies with the alleged 1930s blunders. Instead of the hit pieces that would have appeared after a recession in, say, 2015, pundits would pen bubbly narratives praising the superstars behind the longest-ever expansion. But that’s not the whole story. We suggest asking the following: If the FOMC no longer fears an echo recession, what reputational risks remain? In other words, we agree with those Fed watchers saying the FOMC already shows greater sensitivity to financial risks. We expect further changes in policy priorities until, by 2019, avoiding a recession ceases to be a critical priority. And we expect those changes because we think FOMC members—perhaps even more than most people—care very much about their reputations.